Seriously now, is there anything better than a roasted potato? Unless of course we are talking about mashed potatoes, then we might have something to debate about. As I have proclaimed here before I AM A POTATO HO and proud of it. It’s hard not to be when they are so darn versatile. This dish is my entry for the first-ever POTATO HO-DOWN ROUND UP happening here July 16th…. 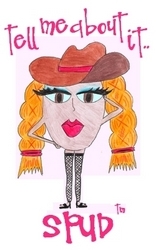 To be a true Potato Ho and enter the round up you are required to use your Ho name (Your 1st pet’s name plus your middle name). So this dish is known as Sparky Marie’s (Noble Pig’s) Smokin’ Red Roasted Potatoes. Stand in line folks, there’s enough for everyone. I love serving potatoes in this style. The first time I saw this technique in cutting the potatoes I knew I had to try it. These potatoes look awesome on individual plates next to a steak and even better when sitting together on a large buffet platter. The best part is…they taste awesome. Adults love them. Kids are intrigued with them. I personally adore them. You must try them. Yep, here she is in all her glory, “SPUD“, Ms. Potato Ho herself, in the flesh or the skin I guess. Isn’t she glorious? When’s the last time you saw a tuberous root vegetable in fishnet stockings? I’m sure its been a while. This badge can be yours too, just get your entries to me by July 14th or 15th and put her on your site with your Potato Ho post. She kind of brightens the place up don’t you think? You know you want her, she totally rocks! Anyway, let’s put these taters together, it looks like a crowd is starting to form. Here’s all you need to turn these spuds into dinner nirvana: Red Potatoes, extra virgin olive oil, salt, pepper, dried tarragon, smoked paprika (or regular), fresh flat-leaf parsley, fresh thyme and butter (which is suspiciously MIA). I think the hooligans borrowed it to grease up their hot wheel tracks. Stinkers. Now here is how you slice the potato, going as far down as is possible, without slicing through to the other side. Set the potato into the bowl of a wooden spoon. Slice down until the knife cannot go any further. Most likely the first little slice will fall off but that is not a problem. I think it looks prettier that way. Once your potatoes are all sliced, cover them with wax paper. Place them on a microwave safe dish and microwave them on high for about 12 minutes or until they can be easily pierced with a knife. Now place the potatoes on a baking sheet. Drizzle extra virgin olive oil between the potato slices. After the olive oil, sprinkle salt, pepper and smoked paprika on each potato. Don’t be shy. Place in a 450 degree oven and roast for 23 minutes or until a lovely golden brown appears on the potato top. Yum. When out of the oven, melt a 1/2 stick butter and carefully drizzle some over each potato. Then, sprinkle each spud with dried tarragon (or fresh), fresh flat-leaf parsley and fresh thyme. Make sure you get some between each slice, it makes it look and taste so much better. You’ll see. The outside is nice and crunchy with the crust that formed from the paprika, salt and pepper. And the inside is soft and yummy from the dousing of olive oil and butter. It’s heaven I tell you…pure and unadulterated. Well, maybe a little adulterated considering the butter and olive oil but we just don’t need to think about that! Place each potato in the bowl of a wooden spoon. Using a very sharp knife slice each potato until the knife cannot cut further. This will give you the characteristic sliced look. After slicing place the potatoes on a microwave safe dish and cover with wax paper. Cook on high for 12 minutes or until they are easily pierced with a fork. Place the potatoes on a baking sheet and drizzle with extra virgin olive oil, trying carefully to include each slice. Sprinkle each potato with salt, pepper and smoked paprika (regular is fine too). Place in a 450 degree oven for 23 minutes or until golden brown. Once removed from the oven melt a 1/4 cup butter and drizzle over each potato. Top with tarragon, parsley and thyme. *Quantities used for this recipe will vary depending on how much you want to put on each potato. These potatoes can also be made with other fresh herbs. Use whatever you like, the possibilities are endless. *Quantities used for this recipe will vary depending on how much you want to put on each potato. these are fabulous! they’d be so fun to eat, and they’re clearly delicious. your pointer about the wooden spoon is much appreciated. i absolutely lurve taters, and i’m excited to try this! *sharp intake of breath* OH. MY. GOD. Those crisp edges, so many of them….must have these tonight. Potato love. Oh my yummy yummy!! Nom, Nom Nom! I will so be making these when I get back from Vegas! That looks delish! I need to email you my info for this entry, but I’ve got to find the pic. Must do that today before I forget again. Those look fantastic! I gotta get my potato ho on. I planned on having leftovers for dinner tonight, but after seeing these potatoes, and it is our day to go grocery shopping, my husband insisted on having those potatoes right away! They look so appetizing! So that means we will buy some nice steaks to go along with the potatoes, and I will try to obtain fresh thyme. That is the only ingredient I am missing. I don’t want to leave out a single thing. You seem to have this recipe perfected! Did you invent this recipe? I bet you did, you kitchen marvel you! It is a great entry to the Potato Ho Down event. It is a winner! I have new potatoes just sitting around begging to be used in this recipe. And it’s Sunday and I’m supposed to be getting ready for church, but I just had to read your blog before putting on my makeup. Now I’ll be thinking about those potatoes when I’m in Bible study….gotta get my mind off those potatoes….what am I going to do? Get home as fast as I can and get to work on this recipe–that’s what will get me through. Those are a sight to behold!! My husband just walked by and glanced at the computer screen. “We’re making those” he announced. I must get to work on the “ho-down”! I am trying to get the time to do a post on one of my favorite recipes. Soon I hope. Those are beautiful. I love, love potatoes too. They are so great for you too–don’t let anyone tell you differently. OMG! I LOVE taters… and these look fabulous and delish. I’m going to the store today! I love you…I’m going to tell you now…I love you Cathy, you and your potato ho(ing) a$$! I love this recipe, I love potatoes….I.love.potatoes!!! Thanks for (yet again) another great recipe. I think that the whole family will like this! Well, except The Boy, he doesn’t do potatoes unless they’re french fried. I know hubby and I will though. this is a worthy potato ho dish. I bow down to you! What a great idea!! We’ll definitely try this one!! I will be back with my link – I’m making almost the same kind of potatoes. Everyone was laughing at me as I took the pictures for my post but they weren’t laughing when they ate the yummy potatoes! They do look impressive and delicious! Where’s the pig? These would be awesome with a couple slices of bacon, pancetta or serrano in acouple of the fanned out gaps, put it in when you put the spuds in the oven, and the pig would cook in the taters, and you could probably skip the butter (not that I would). Oh Yum! Those look great! Maybe I will try them tonight with a nice grilled steak! hello, my name is miriam and I am a potato ho. Ok, those rock. That crust is speaking to me. I would so dip those babies in a little bit of sour cream then into my mouth. Yes the action shot on my pancakes did feel like it took a year..but it was worth the wait! Oh Lordy those look di-VINE!!!!! What is your suggestion for getting the taters soft before baking….without a micro wave? I don’t have one and these looks so amazing I MUST try them tonight!! Wonderful photos and great description of the recipe! Fun website as well, I look forward to seeing more! Oh wow, that’s a hard one! I don’t know it there is an option. You can’t boil them, they would fall apart and the skins would fall off. I feel I’m at a loss here. The microwave and use of wax paper steam them perfectly. So sorry…does anyone have any suggestions? Love the site. Sign me up!!! I was so excited when I saw this email post that I made these for my lunch today! The only change I made was to use fresh tarragon from my garden instead of dried. The paprika gave it a wonderful smokiness. One word…..DELICIOUS! Thank you. Those looks absolutely delicious. I am a potato addict! For softening the spuds, maybe you can steam them for a while in a double boiler? If you don’t have one of those, get a pot of water boiling, drain the water, put the spuds in the hot pot and cover with a dish towel to hold in the steam. BTW..I have the Tshirt…I Da Ho…LMAO! Ummm, Cathy – how do you get a Potato Ho name if you don’t have a middle name? One small disclaimer – I do love potato skins. Those blue sky potatoes you had up a while back – I would eat those in a heartbeat! I just don’t like mashed more than anything. Why, oh WHY did I have to Stumble onto this site when I’m starving? This is torture! Cathy – These look great! I almost forgot about your potato ho hoe-down since I’ve been on vacation. I don’t know if I can get another post up by tomorrow or not, but if I can, I’ll be sure to email my potato ho entry ASAP!! Good luck with the event – I’m looking forward to all the carbohydrates… YUM! Stumbled on to your site. I’ve fixed potatoes like this for a few years now, varying the herbs & spices. May I make the suggestion of instead of using a wooden spoon to cut them, tape some wooden chopsticks to your cutting board & then hack away. I enjoy the site & cant wait to read more! Wow! What a great presentation! Those potatoes sound tasty and I really like the cut! Now that is something I will most certainly try. They look just great. Hey, who drew the Spud Chick? I love her! It will take a while – but try steaming them in a bamboo steamer over boiling water. Or even a metal steamer. That way, they won’t go mushy (by boiling). Pretty and tasty. A real winner. I recently went to a cooking demo and the chef used an expression I really liked. She said “we taste with our eyes”. So important for presentation to be appealing. A lovely girl named Julia drew our Ho. Get this, Julia is only 15! Very talented at such a young age. I’m very jealous. We tried the potato recipe this evening. I followed your instructions and they came out perfect. That was the tastiest potato I have ever eaten. No kidding. The best ever! I second the idea of using a steamer, or rigging up some kind of steamer big enough to accommodate the spuds if the steamer you already have — IF you have one — isn’t big enough. Perhaps a cake rack in a large skillet, with simmering water under the rack (you’d have to keep it topped up, as it would be shallow and would likely simmer away to nothingness if you didn’t….). Good luck! I am salivating over here. Mmmmmmmmmm! Bookmarking this one for sure! Brilliant! It’s rare to see potatoes prepared in a new way, but now I have and I will be trying these out. Thanks! Oh Yum!!! I love potatoes. These look fantastic!!! Looking at those potatoes all i can say is……..i think i have died and gone to heaven. yum! Cathy: You are AMAZING! Such a delicious-looking post, and so good for you, too! Buddy John and I stopped over to SHAGGY’S on the beach in Pass Christian for lunch this afternoon, and we had fresh speckled trout sandwiches, which were out-of-this world! I should really take up cooking, I like to eat so much. We tried this recipe tonight and it was fabulous! This will definitely be on our menu a lot. We paired this with cajun marinated shrimp, cucumber salad and green pole and yellow wax beans. The beans and cucumbers came from our garden! Can I just move to you house and you cook for me? I’ll leave the kids and husband at home. I just used lavender to make a frosting for some mini chocolate cupcakes I made a for a bridal shower…turned out quite yummy. I’ll have to try it on my potatoes next! I just made a similar potato the other night (paired it with steak – YUM!). I placed sliced onion in between the potato slices, a pat of butter on top and sprinkled the top with a spice blend, wrapped them in foil and cooked them on the grill. I have to say they were quite tasty but not nearly as yummy as yours look. Will definitely be trying these next time! Beautiful pics – thanks for the tip about the spoon! Hasselback Potatoes!! My grandmother used to make these with her famous prime rib every Christmas!! Yummmmmmm!! I would pimp that potatoes with bacon bites and melt bleu cheese on top of that or sprinkle Gramolata on top. I want that potato vixen on my site! I need to go buy some potatoes, well today huh? Yours look amazing & I’d love them with a little dip of ranch! These look amazing! I’ve made something similar (Hasselback Potatoes) with regular potatoes, but I’ll have to give your recipe a try! I can feel the potato hips forming now. OMG…I think you’ve oh so nobly made me a potato ho with this delicious recipe and wonderful photos! Oh I feel the “potato ho” rearing its ugly little head in me. These are on my list tonight for dinner….I don’t even care how hot the house is. I love smoked paprika — and this is yet another fine application for it. I’m also with Pookandhouse on the bacon and/or bleu cheese (after all, “When in doubt, add more snout!”). I’ve GOT to get my entry together for the ho-down. Seems everything is ready except that picture. The one I have isn’t so great, but it might have to do. Time is fleeting! I looove potatoes, and these looks so simply delicious, and beautiful too! Beautiful presentation, simple preparation and I bet they are absolutely delicious. Great post and excellent recipe, Cathy! Now that’s a way I’ve never seen a potato done before! Looks mouth-watering delicious! Oh. My. Word. Just when I think you can’t post a better recipe, you outdo yourself. Yum. Ever use rosemary on your potatoes? I drop a couple of sprigs of fresh rosemary in the pot when I boil for mashed or potatoe salad. Mmm! I’ve been stalking you a little bit. Well technically, lurking might be a more appropriate word. Nonetheless, I felt compelled to comment the moment I laid eyes on your first photo. I’ve never seen such a good looking potato in all my life. I think you’ve made ME a potato ho. You elevated that potato to a place I’ve never seen potatoes. And I feel so deprived….I don’t even have a middle name. The way you prepared those potatoes is awesome – I love how they ended up looking! I baked these and I just finished devouring my second potato! These are divine! You’re right, the butter changes the depth of flavor (I thought olive oil alone would be sufficient) and th roasted bottom is a great treat. I love the name of this recipe and I love these potatoes! The step by step photos are great, too! Yum! Technically, aren’t you a potato pimp? Anyway, I baked these and I just finished devouring my second potato! These are divine! You’re right, the butter changes the depth of flavor (I thought olive oil alone would be sufficient) and the roasted potato bottom is a great treat. Since it’s a couple of days late; the only thing smokin around here are my snausages, those hot little smokies that feel like I need a fire extinguisher to put the fire out; you know my feet, the toes, see the smoke? Those look so beautiful and such and awesome serving idea. I also believe I have seen many things in my life but a tuber in fishnet stockings yeah never before till now. this looks like a wonderful dish. i to love roasted potatoes. i will definitely be trying this recipe. these look dee-licious–I am making these tonight. Well, your potatoes really are smokin’! Seriously, they look fabulous! I know they’d go over big around here. Great recipe! Will definately have to try it, as I too am a Potato Ho and love anything with potatoes! Nice blog, will check back often. These potatoes look amazing. Will try this one for sure. i love potatoes in any form, and this one does not disappoint! if you get enough oil on the thin slices, you end up with a thick, crunchy potato chip! Best looking potatoes I’ve seen! This is what we call Hasselback Potatoes in Scandinavia. And I love them. WOW!! Those look delicious!! Can’t wait to try them!!! For crying out loud, put the recipe at the top of the article. This is not a case where “a picture is worth 1000 words.” Quite the opposite — 100 well-chosen words are much more valuable than these photos. I’m tired of looking at recipe-sites filled with lame amateur food photos. I want quality, tested recipes. Quiet Grace!Can’t you just enjoy the beauty of good food! Just scroll down…jeez… Luckily this recipe is easy enough for the *laziest* of us…. Anyways, I just made this recipe and I must say: these are the best potatoes I have ever tasted and I absolutely LOVE potatoes! Thanks for this. God bless you! now, is that 1/2 stick of butter per spud? Looks delicious! Love the paprika. I have been making something similar on the grill (oven, in winter) for years passed down from a neighbor. Not quite as pretty as yours though! New potatoes sliced, sprinkled with salt and pepper, halved and sliced 1/4″ thick (as much or as little to taste) placed on the potato, a small pat of butter on top and wrapped in foil. Place on the grill for 45-60 min. Easy and no clean up! The butter draws the flavor of the onions through out the potatoes and not much butter is needed plus the onions are almost caramelized. I’ve also made them with garlic and rosemary for the non-onion lovers in the crowd but make sure to use whole garlic cloves as crushed garlic can burn. Oops, sweet or red onions somehow got deleted after the salt and pepper. Awesome potatoes! Thanks. Try these with a twist on this recipe, toss in olive oil and coat with s+p to taste. Slice clove of garlic very thinly and insert garlic into slits on potatoes. Serve with a dollop of chive sour cream. My name is Dan, but as there seems to be no Potato Pimp option, just call me by my potato-ho name, Cammie Christoper. Sweet! Reminds me in a way of this”>http://herbivoracious.com/2008/07/tofu-in-the-sty.html”>this technique for cutting tofu. WOW! And my HO name is Cloudy Elizabeth–awesome! I saw this recipe years ago, but at the end of baking in the oven, they topped with cheese. I tried it for a group dinner and it was a big success. Either way, it draws much attention! These look so awesome! A great new way to fix potatoes. Can’t wait to get off my diet to try them! Wow, they look absolutely heavenly! I’m totally gonna give this recipe a try tomorrow. We cut and cooked potatoes this way a couple of weeks ago, they really worked well. I made a wonderful change to this recipe for an early Thanksgiving dinner I went to last night. I found this wonderful set of grape seed oils that have various flavors like lemon, garlic, basil, and even chili (plus they are all sustainably made in Napa Valley with no extra additives except the plants used for the flavor). I used the chili flavored oil instead of the olive oil, and let me tell you, they were fantastic. The chili flavoring is not very hot, and it was the perfect amount to really kick these potatoes up (another) notch. If you are interested, their website is http://www.grapeseedoil.com. I found them at the Green Festival last weekend, and I fell in love with the flavors right away. Bringin’ up teh rear here…these little morsels are bringing back some memories. I swear I tried to make them once and failed miserably so thanks for posting the so I can get it right. We’d skip dinner and just have the taters. Ha! Hassleback? Something like that? Do you know? I think I might have to make these tonight!! They look delicious and I am a big potatoe fan as well! I am making these tonight for my boyfriend! Milk helps keep me fit. Just searching the internet and came across this page. My mother loves potatoes and will have to forward this to her. These look really delicious. That sounds good also. So many great ideas. I will have to bookmark this site. Just stumbled across your blog. These look really delicious! I’m definitely making these to accompany my (hopefully tasty) smoked chicken. This is the fourth recipe I try from this blog and it was super good. The potatoes not only looked super cute, they also tasted amazing. EMERGENCY! I just made those (and they smell soooo goood) but I forgot that I have nothing in the house to go with them. We’re even out of sour cream. Any quick suggestions? I have some hamburger, fish sticks or salmon but I don’t think any of those are gonna cut it… What did y’all have with them? I made these potatoes before and they are delicious! I’m sure you’ve made a lot of web people happy by posting this wonderful recipe. I don’t own a microwave, anyone lend assistance of how to make these without the use of one? Ooh I have some potatoes and maybe this will be a great side dish for tonight’s dinner! Thank you! We do a similar recipe, where you melt cheddar cheese into the potato slice cracks, then dip in hot sauce and treat like nachos. Very good! Those pictures are making me hungry! Would love to see a video of the same dish. That looks amazing! You could also put thinly sliced garlic in between some (probably not all) of the cuts for a little extra flavor. Great recipe, and they taste a little better if you add just a dash more of salt. Great with friends and family, perfect social food.